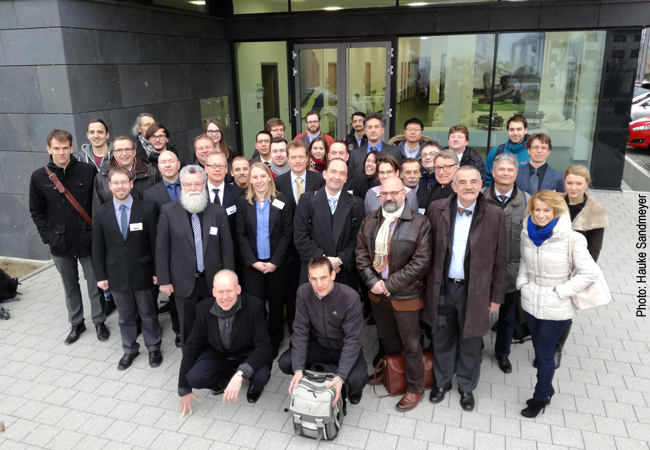 The German Research Foundation (DFG) has approved a new Transregio Collaborative Research Centre (CRC/TR) in which physicists from Goethe University Frankfurt, Bielefeld University and TU Darmstadt want to explore together “strongly interacting matter under extreme conditions”. The researchers had submitted an application for around€8 million for the next four years for this. Spokesperson for the new research alliance, which within the partnership with TU Darmstadt is also supporting the Strategic Alliance of Rhine-Main Universities (RMU) launched at the end of 2015, is Frankfurt physicist Professor Dirk Rischke. “Extreme conditions” means high temperatures and densities such as occurred, for example, in the first millionth of a second after the Big Bang: A few billion degrees Celsius (a hundred thousand times hotter than the Sun’s interior) as well as multiples of the density reached in atomic nuclei (several 100 million tons per cubic centimetre). Under these conditions, matter is dominated by what is known as strong interaction. This is one of the four fundamental forces in physics. It is responsible, amongst others, for the proton and neutron composition of atomic nuclei and for their inner structure of quarks and gluons. Under extreme conditions, strongly interacting matter forms new types of state, comparable with the various aggregate states of water as ice, liquid and gas. Whilst this is being explored experimentally on large-scale particle accelerators such as the LHC at CERN in Geneva and in future on FAIR in Darmstadt, the new CRC/TR wants to examine the topic from a theoretical perspective. The intention is to investigate the fundamental properties of strongly interacting matter in the framework of 14 sub-projects and apply them to the physics of the early Universe and in heavy ion experiments. The declared objective here is to start as directly as possible from the fundamental theory of strong interaction, i.e. quantum chromodynamics (QCD). This theory, for the study of which several Nobel prizes have already been awarded, has been known for over 40 years. It has, however, nonetheless proven difficult in many cases to make concrete predictions in the framework of QCD. Deriving in particular the properties of macroscopic concentrations of strongly interacting particles at high temperatures and densities from QCD was so far unsatisfactory. All three universities are equal partners and this is underlined by the fact that they have already agreed to rotate the role of CRC/TR spokesperson after each funding period, should it be successfully extended. “The complex theoretical questions as well as the experiments currently taking place or already planned in this field of research, where a lot is happening in other countries too, will stimulate a wide spectrum of research projects over the coming decade”, says Karsch. “That’s why we’re convinced we can fill the maximum 12-year duration of a CRC with interesting projects”, agree Rischke, Karsch and Wambach. A CRC in the field of medicine has been extended. In the framework of CRC 1039 “Signalling by fatty acid derivatives and sphingolipids in health and disease” researchers are investigating what significance lipids (fat molecules) have as signalling molecules and how they are involved in disease processes. This means that the collaboration between Goethe University Frankfurt and the Max Planck Institute for Heart and Lung Research in Bad Nauheim can continue for the next four years. Numerous findings in recent years indicate that lipid metabolism disorders contribute to the development and progression of diseases such as arteriosclerosis, diabetes, cancer, inflammatory conditions, pain and neurodegenerative diseases. They are therefore suitable drug targets. In the first funding period, the researchers concentrated on examining the synthesis and degradation pathways of molecules that intervene in healthy as well as disrupted lipid metabolism. The intention now in the second funding phase is to investigate these molecules, which are known as lipid mediators, in relation to specific diseases such as acute and chronic inflammatory conditions, pain or tumour development. “We want to advance research in the direction of functional consequences as well as of diagnostic and therapeutic implementation, both experimentally as well as clinically,” says Professor Josef Pfeilschifter, CRC spokesperson.